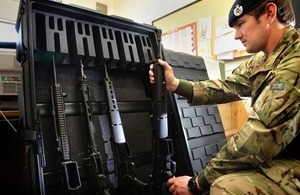 CP Cases has won deals to supply its cases and racks to the Italian military, and also a £400,000 contract with the Indian Army. India and Italy were just 2 of a number of overseas markets which CP Cases has explored with the help of UK Trade & Investment (UKTI). Their protective cases are suitable for use in a wide variety of applications both commercial and military. CP Cases decided to commit themselves to expanding internationally 8 years ago after receiving an order from the US. 40% of its business is now export orientated rising from 13% in 2010. There are not enough reasons not to export and every reason to. UKTI’s funding, international network and advice has opened doors to us which most Small and Medium Enterprises (SMEs) cannot access alone. All the events, networking and workshops have been useful and have changed our attitudes to exporting. India is one of the fastest growing economies in the world with recent growth levels reaching close to 9%.The new contract with the Indian Army is expected to bring £400,000 of additional revenue to CP Cases. Having the backing of the British embassy made a huge difference in setting an impression with international buyers. Their presence at the meeting and advice has again been invaluable for our small businesses. Not enough people know this, but there are a huge amount of resources available from the British government; it is there for the taking. CP Cases received support in setting up client meetings with military bases in Rome via UKTI’s Overseas Market Introduction Service (OMIS). This enabled them to secure a number of deals in Italy, including selling directly to the Italian military. They also secured a deal with the European International Rescue team for the region. They will use CP Case’s equipment to carry essential medical equipment in the field for rescue operations. CP Cases came across UKTI at an exhibition in 2006 and sought help to gain new international customers. It was paired up with Mel Langton, local UKTI International Trade Adviser (ITA) based in London. Arrange a face-to-face meeting with a UKTI trade adviser. CP Cases joined UKTI’s Gateway to Global Growth programme which enabled them to focus the business in preparation for international trade. They also explored potential business through assistance from the UKTI teams in British embassies overseas. The result has been new business totalling £2 million from contracts in India, Italy, Russia and the United Arab Emirates (UAE). The assistance from UKTI to get out into these markets and sign deals has been very important. The support in putting us in front of industry contacts has been crucial in helping us get our foot in the door which would have otherwise taken years to accomplish. The business has evolved in order to meet the demand from the markets it’s exported to. We have had to adapt the business for the constant flow of overseas business. We have hired 5 new members of staff recently all within an export role, and I have positioned myself in the business to focus on export development for the company. I visit the markets regularly to meet our clients face-to-face. This is all as a result of the being encouraged into exporting. CP Cases has been in business for over 35 years. It designs and manufactures bespoke cases and racks used for transport operations and storage of essential equipment. The cases are built to carry anything from military equipment in difficult terrains to broadcasting equipment for the media. The company is based in London and manufactures all its products in the UK.